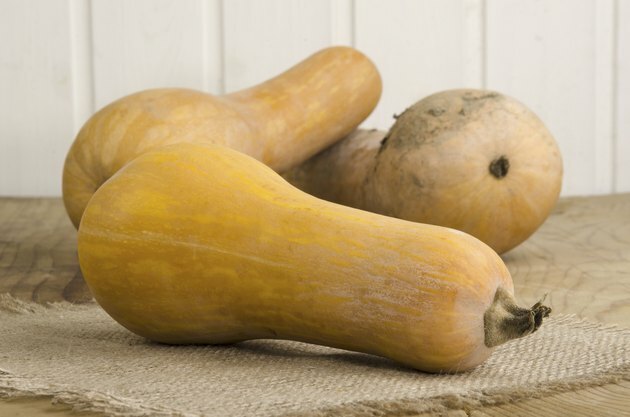 What Is the Glycemic Index of Butternut Squash? Butternut squash has a moderate glycemic index ranking and a low glycemic load. It's also low in calories, a good source of fiber and an excellent source of vitamins C and A, making it a healthful choice whether or not you need to watch your blood sugar. The glycemic index measures the effects of the carbohydrate in a given food on blood glucose levels. Foods are ranked on a scale of 1 to 100. The higher the number, the more quickly a carbohydrate raises blood sugar. A more useful number is the glycemic load, which ranks food by both its glycemic index number and the amount of carbohydrate in an actual serving size of the food. Butternut squash has a glycemic index ranking of 51. Based on a serving size of 80 grams, or about 1/3 cup of boiled, mashed squash, butternut squash has a very low glycemic load of 3. These are numbers for plain squash. Adding sugar, butter or other ingredients can affect the vegetable's glycemic index and load.